He's a solid 6 Skill for 5F who does not care if he's Dishonored, inherently. Sounds like our guy to me. I'm still looking at Dragon for dueling, so... I will see if I can fit him in my deck. Though I may be needing to run 3x of this card just to protect my guys. Also, on the "Honored" condition, it appears that an Honored personality who leaves play gives you 1 Honor. I'm expecting to see semi-Robot Phoenix low Fate blitzes that rely on Honoring your Personalities without Fate on them, and letting them leave play to honor rocket. 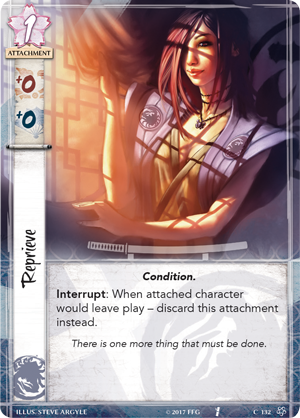 One counter to that would be to declare Fire conflicts so you can dishonor their characters, or use other Conflict cards that do that. Which would put the Scorpion Dishonor deck ahead of all the competition if the cyborg (semi-robot, close enough) Honor runner is a dominant deck type out there. And we are back to Rock-Paper-Scissors. Though I would be very happy with Spock-Rock-Paper-Scissors-LizardMan. Right now we only know of one ring-switching effect and one type-switching effect. If you switch the type, even if the attacker loses the defending Phoenix player doesn't get to Honor anyone so that's still a small victory. If you switch the Ring...well, okay gotta try again next turn. Both Mori Kuroi and Elemental Fury can switch rings. Mori Kuroi just has the added option of changing conflict type. Yeah, I would say that relying on winning particular Rings is going to be a challenge of people playing against the Phoenix. Especially with the Personality they have revealed, I would not be surprised if the Phoenix can change the Ring of the Conflict fairly easily, and then have different Actions on Personalities and Attachments which interact with the Ring of the Conflict. Last edited by sndwurks on Mon May 08, 2017 8:59 am, edited 1 time in total. Yeah, I would say that relying on winning particular Rings is going to be a challenge of people playing against the Phoenix. Especially with the Personality they have revealed, I would not be surprised if the Phoenix can change the Ring of the Challenge fairly easily, and then have different Actions on Personalities and Attachments which interact with the Ring of the Challenge. What is a "Ring of the Challenge"? David misspoke mildly. He meant the 'Ring of the Conflict', as in, the Ring being contested in that particular Conflict. As is frequently the case, Mark is correct. I have edited my original post appropriately. Intrigued by the game...but still approaching cautiously. Will be interesting to see how FFG's changes affect the game.